The biggest perk of pressure washing is that it can make taxing or tedious cleaning jobs much easier. Additionally, it can get surfaces that may be difficult to clean looking bright and new without the elbow grease. We take a great deal of pride in our cars and want to make them look their best. Pressure wash your vehicle with ease by following this guide. What Kind of Pressure Washer Should I Use to Wash my Car? It is important to note that pressure washers are designed to push away the toughest dirt and grime, and sometimes they are used with the intended purpose to chip away old paint. Keeping this in mind, you should pressure wash your car with extreme car. Using the wrong nozzle, or using a too strong PSI can lead to damage for your car. The being said, you don’t need to turn your pressure washer into a garden hose. You can still use a little bit of pressure. To put this into perspective, the average garden hose has 40 PSI and 7 GPM. The generally advised setting for using a pressure washer to wash your car is 1500 PSI and 1.5 GPM. With a pressure washer, you will get the job done faster and use less water in the process. Given this level of cleaning units, you will likely want to use an electric pressure washer as the gas models may be too strong for washing a car. Different nozzles change the distribution of the water to create more or less pressure. The more narrow the stream, the more pressure it is putting out; however, less surface area is covered. The basic nozzles come in four color, each color representation a different pressure setting. A red nozzle is a fast, hard jet of water that is extremely narrow and a yellow nozzle is somewhat wider but is often used to strip paint. Red or yellow should be avoided for a car wash. Green is the next setting, which is often used for cleaning wheels and truck beds and is a great setting for a pre-wash rinse as it’ll take of dirt with it as it goes. The white nozzle is often the widest and cleans large areas fast so this should be used for the surface of the car and for rinsing detergent or soap. Finally, the black nozzle is the nozzle used for applying soap and has a very light bit of pressure. Settle yourself into an open area which you can walk around your car freely without running into anything. Find a hard surface like a driveway or on concrete rather than over gravel. Small stones could definitely fly around. Plan out how much space you will need, especially if you are using an electric pressure washer. You may find that you will need an extension cord and it is much easier to have that prepped ahead of time than to stop and find one in the midst of washing. If you are considered washing your car engine as well, you should take caution if you plan on using your pressure washer. While it can be safe to clean the engine with a pressure washer, all electronic components needs to be safe and kept covered. The newer the model of the car, the most likely it is filled with tons of electric pieces that may cause you a massive headache if they get wet or are hit with just a little too much pressure. This may go without saying, but make sure all the windows are rolled up, the doors are closed, and the trunk is closed. All is takes is one slight opening to have extensive water damage inside your vehicle. Have all the supplies you will need ready before you begin including any additional tools, towels, and detergent that you may use. For a detergent, use a product that is designed for pressure washers and not just a random jug of car wash goo you found in the garage. Karcher Car Wash and Wax is a great option. Your car will be shiny and new looking, plus you can get it fast in your have Amazon Prime. Often you may need to dilute the detergent with water, so read the packaging first and follow the directions. Additional tools you may consider are things that are not necessarily important, but might make the job easier. A rotating car wash brush designed for pressure washers can work great for scrubbing dirt without increasing the pressure on your pressure washer so you don’t end up damaging the paint. Test out using the pressure washer by standing 4-5 away at first, then moving closer as needed. While the nozzles control how much pressure is used, you may inadvertently apply too much pressure if you’re standing too close. Once you’ve found the right distance, rinse the car all over to push away mud and larger debris from the surface. Include the wheels with the rinse. Once the rinsing job is done, you can use the black nozzle to apply the detergent and spray your car once again. The best method is to start at the top, and work your way down. Letting the detergent sit for a few minutes is usually a great idea as it can pull dirt from harder areas, but be careful if you are washing your car on a hot summer day. The soap could start drying and leave unattractive and annoying lines on your car. Rinse the detergent with the white nozzle in a downward motion starting at the top. You may apply detergent and rinse again if you so desire. Following this method of washing your car with a pressure washer will give you satisfactory results and you take your car out for a joy ride and show off your shiny and clean car. An often neglected area of your car is the undercarriage, and if there’s anything that will help you make the undercarriage look good as new, it’s a pressure washer. Use a degreaser to help access areas that have significant dirt build up, or that may be difficult to reach with a pressure washer. You can also get a tool, like this undercar cleaner attachment, that makes cleaning your undercarriage a breeze. 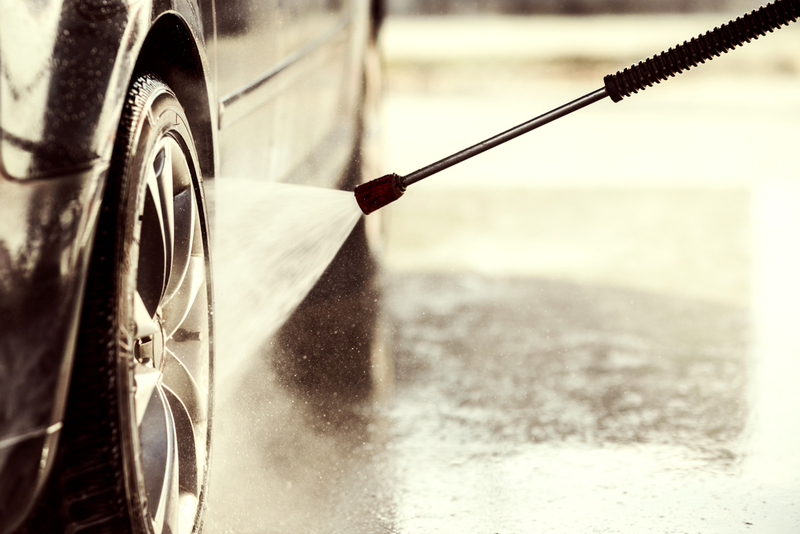 If you do not already have a pressure washer and are considering buying one to wash your car, you may want to take note of certain features before you buy. If you have a small car and do not intend to use the pressure washer for any large jobs, a more lightweight model would work, and would make moving around your vehicle a little easier. But even if you only want the pressure washer to wash your car, do not go for the lighter models if you have a big SUV or truck. The larger the car, the bigger model you’ll want to consider. Keep in mind where you are going to be cleaning your vehicle as well. A gas model may be more portable, but is not a good option if you are intending to use it in a barn. You should also think about the water source, and you may need to consider a filter to prevent debris or hard water marks. Definitely determine if the pressure washer has a soap or detergent tank as just simply water is not going to help you. Sun Joe SPX3000 by Snow Joe–Electric, PSI 2030, 1.7 GPM. We like the SPX3000 because of its excellent performance and moderately low price tag. At a price of around $150, you get a solid pressure washer with 5 spray tips. The spray tips use Quick-Connect technology, which makes it so you can switch to different nozzles depending on which area of the car you are focusing on. The AR Blue Clean is a high quality and durable unit, so it is great for using for multiple jobs around your home or property. The long power cord make it so that you can move around your vehicle well, regardless of its size, and has an auto-shut off motor to preserve its life. A solid unit with a smaller motor that can help reduce water usage. While it may make the job take a little longer, the lower rate of glow drastically reduces the water use and this can be a great option is you’re worried about a pressure washer consuming water like crazy. The downside of this unit is simply the price tag, as you’ll need to spend a little bit more to get this beauty. With a 2000 PSI, this unit is great to use more things more than just car washing, and the 1.4 GPM means that you can finish a car wash within minutes. Additionally, Karcher units come with a patented corrosion-resistant pump so maintenance of this unit will be greatly reduced. What Is The Best Pressure Washer Detergent? Can an Air Compressor Become a Pressure Washer?